Making kebab is almost a cult experience. I am far from a member, but I enjoy making and eating my version. I've had a variety of versions of this dish and I can't say which I like better. I am an equal opportunist when it comes to any dish where the cook is passionate about its preparation. Cut meat into cubes, they don't have to be perfect but try to keep them consistent in size, about 1.5 inches. Salt the meat and place in a gallon sized zip lock. Mix the other ingredients in a small bowl and add to the bag. Close the bag and place in the refrigerator for at least 12 hours. When ready to cook, cut 2 medium apples (skin on) into thick wedges, removing the seeds. Skewer meat, onions, and apples in a repeating pattern. This should make about 6 skewers. Grill (on a charcoal grill if available), rotating frequently, until golden on all sides. Enjoy outside with an ice cold beer and at least one friend! ﻿Another classic dish from my hometown, though with roots from Georgia; short rib and prune stew is an amazing combination. Buttery, fall-off-the-bone meat is complimented with sweet and tart sauce from the slow-cooked prunes. Pour hot water over prunes in a small bowl. Allow to stand while you continue with the recipe. Braise the short ribs on medium-high heat in olive oil, in a dutch oven. You may need to do a few batches to allow for plenty of space for browning. When they are well browned on all sides, add in the onion cut into small wedges and the shredded carrots. Let cook mixing occasionally, until the onions start becoming soft (about 7 minutes). Add in the drained prunes. Add in the chicken stock. 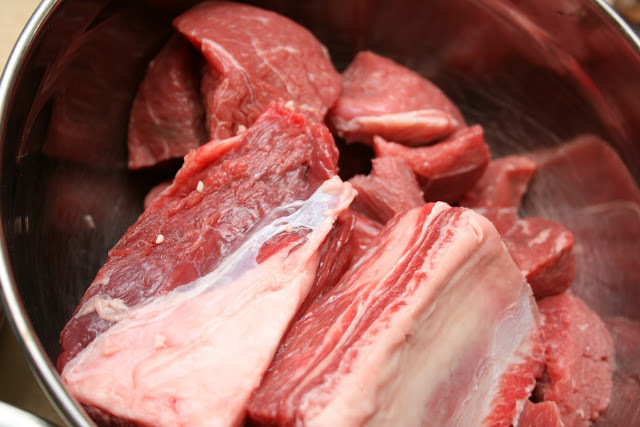 If the stock doesn't cover the meat fully, add some boiled water to cover. Cook on medium/low heat, covered, for about 1.5 hours. Check about 1 hour into the cooking process to assure you have enough liquid to avoid burning your stew. This is a good time to add your bay leaves and salt to taste before you add any additional liquid (you don't want to salt at the begining as the liquid will cook down). This salad is in the repertoire of many USSR expats. Fresh, crunchy and great as salad but also inside a roast beef wrap. Mix the vegetables and dill. Pour over the premixed Vinegarette. Let stand for 5 minutes, then squeeze the salad with your hands several times. The purpose here is for salt and acid that were just added to wilt the cabbage strands a bit. They will still be crunchy, but will act like a sponge and take on the mixed flavors in the salad. Toro is a great little tapas place in town, serving an unusual tapas menu when compared to restaurants with a similar cuisine. No, you won't find pato braseado on their menu, but you'll have a great short rib and plum stew. It is there where I found the inspiration for this salad (read: copycat), because imitation is the greatest form of flattery. My version differs from that of the restaurant but the final result is similar and ranked highly with friends. Shred queso fresco and mix with Crema Mexicana. Press garlic and add to the mix. Add in sliced limes, cut into 12 wedges. Roast frozen corn kernels in olive oil, mixing frequently, until the corn is hot. Sprinkle with chili and mix in the queso fresco dressing. Serve immediately.